• Lawsuit filed challenging 2014 election results. AUSTIN, Texas—In a suit challenging the outcome of the 2014 Austin City Council election, Dr. Laura Pressley has presented the court with extensive evidence of vote fraud. Among other things, her charges include allegations that official records of votes have gone missing and that computer disks that store voter results have turned up corrupt. Dr. Pressley, a longtime resident of Austin, ran on a wave of popularity for the District 4 seat versus recent district “import” Gregorio “Greg” Casar. The November 4, 2014 general election was won by 25-year-old Casar, but it had several anomalies in apparent violation of state law. As a result, Dr. Pressley demanded a December 16 runoff, where evidence of an unlawful election became even more apparent. Yet Casar was catapulted into office, where he’s now making city decisions. Pre-election surveys and exit polling of voters during the general election indicated that Dr. Pressley was making a strong showing and had a solid chance of winning. But when the electronically cast votes were tallied, Casar was declared the winner by an improbable two-to-one margin. The mail-in paper absentee ballots—far less prone to sophisticated tampering—came in at exactly 240 votes per candidate. “Had the [overall] election been ‘51 to 49,’ I wouldn’t be here. But two to one? 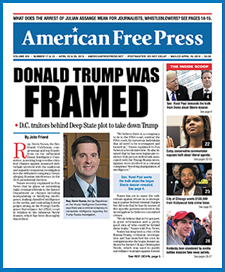 Give me a break,” Dr. Pressley told AMERICAN FREE PRESS for a story with far-reaching implications in a nation where elections, from small-town constable to U.S. president, are decided with electronic voting machines operating with secretive source code. • The official ballot images from the election, used in digital form when voters cast their votes via the Hart InterCivic touchscreen machines, are missing. Texas Election Code, section 52.001, requires using an official ballot. • The election “tapes” are missing. These are printed paper strips that list the final vote totals per candidate, but which were not posted and signed by judges, as the law requires, at the voting stations right after the polls closed. • An electronic disc used to record votes (a digital ballot box) was corrupted. Texas, unlike most states, defines an official ballot. On paper or on screen, each ballot must have a unique serial number, with the proper date, the name of the election, all the candidates’ names with boxes next to each name, and voting instructions. In a phone call to Alicia Pierce, communications director for the Texas Secretary of State, asked by AFP whether official ballot images are stored at the state level, responded, “We certainly do not at the state level.” She didn’t seem to attach any urgency to the matter. A Travis County election official, who would not give her full name, apprehensively said to AFP, “I’m afraid I can’t answer your question until I consult with some people,” which she acknowledged meant lawyers. In 1997, the Texas legislature by statute enacted the official ballot requirement in anticipation of the introduction of electronic voting. Most importantly the Texas Constitution also requires it. But as Dr. Pressley told an audience during a recent public presentation, recorded by an AFP liaison, the failure to store the already-voted official ballot images is epidemic across Texas. The same goes for missing tapes. She added: “So there were no records retained to document how the computer ‘said’ we voted.” In his initial ruling, Republican Judge Dan Mills issued a summary judgment, declaring there was “not even a scintilla of evidence” that the election was rigged, said Dr. Pressley, who filed thousands of pages of evidence. That includes Mills blocking her from deposing an election worker to secure testimony on why that worker kept inserting corrupted cards into the machine. She is also requesting access to the actual corrupted memory cards—another request she says Mills blocked. Mills even sanctioned Dr. Pressley $40,000 and her attorney $50,000 for filing a supposedly frivolous suit. “There was even a deal on the table that they’d forgo the sanctions if we don’t appeal,” she noted. Nonetheless, she’s appealing Mills’s ruling in the Third Court of Appeals in Travis County. With a doctorate in chemistry, Dr. Pressley has spoken out against everything from the city’s water fluoridation to digital “smart” electric-usage meters believed to imperil human health. She feels the city establishment tapped Casar to run against her mainly over her unsettling assertions that questionable subsidies and fee waivers are being doled out for construction projects and public-private partnerships, including millions in subsidies to local festivals. Texas, especially Travis County, is a hotbed of attempted reforms, with grassroots activists pressing officials to recognize electronic-election fraud and return to paper ballots, hand-counted at the precinct level and placed in a clear box in front of a camera, with no break in the custody chain. This is something that noted election-reformer and author Bev Harris maintains must happen nationally for U.S. elections to mean anything. As was the case with the Alamo 180 years ago, Texas is a pivotal battleground for momentous change. Makes me wonder if the same corrupt tactics will be used to prevent certain presidential candidates from winning the next election. Click here to see a video presentation of her whole Voter Fraud lawsuit.